Some of you have contacted us asking about how our software compares to the FAA written test prep programs offered by intensive ATP programs and heavily advertised nationwide schools. 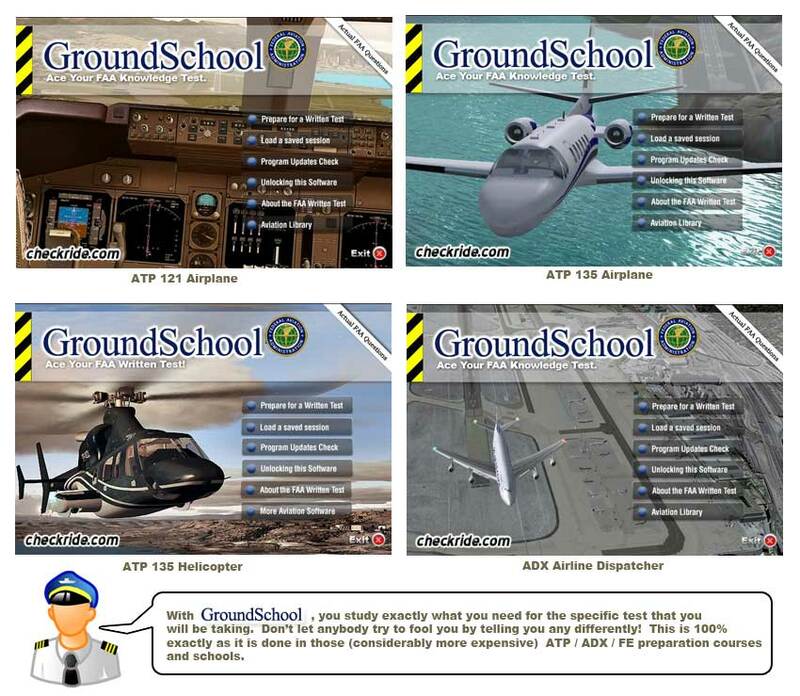 To be clear: We think AllATPs is a GREAT place to FLIGHT train for your ATP or multi-engine rating. The professionalism of their instructors and efficiency of their program are second to none. We highly recommend that you do your FLIGHT training there. Several of us did ratings there, and for this we give it a big thumb's up! However, we are confident that you will be MUCH better off using our software as far as preparing for your written test goes. Frankly, if you go to such places for your written test prep, you are WASTING YOUR MONEY. Sure, you might know somebody who went to such a place and passed their written test, but that doesn't mean that it was a good use of their time or money. Ok - that's a pretty bold statement. Let us explain why. Basically, our software costs a small, fixed price to prepare for the ATP or FE written (and there's even greater deals to be had if you buy both together or in one of our available combo packages). Their programs, the last time we checked, cost $295, or $200 if purchased with a flight course. I don't know whether this fee includes the testing center fee or not, but in either case, they charge a LOT MORE THAN WE DO for their ATP and/or FE written test prep. A LOT MORE. Both can prepare you for your ATP or FE written in about the same amount of time, but GroundSchool costs MUCH less and has other real advantages. What do you get if you pay more money? AllATPs claims on its website that it has gone through the test bank and pulled out only the questions that you are likely to see on your ATP Part 121 test (they mostly do Part 121). For example, they claim that they have removed the 135 and helicopter questions. Well guess what: we've done EXACTLY the same thing. In fact, we work FULL TIME on categorizing the questions and keeping them up to date. It's very simple - in our software, just select "ATP Airplane - Part 121" (or whichever test you are interested in) and voila--the questions are filtered. We have people working FULL TIME on getting the best current FAA questions for you to study. Tens of thousands of people have used our software to take and pass their FAA written tests. We are not sure if AllATPs claims this or not, though there have been some flight training organizations that have claimed this in the past.. basically, they've claimed some mystical link with the FAA to get you studying the "current" question pool. Such claims are absolute nonsense. The FAA question pools simply don't work that way and (and again,we're not accusing AllATPs of this - we've heard this claim elsewhere) anybody who claims otherwise is basically lying. What they are trying to do is confuse in your mind the issue of having "filtered" the ATP question banks, by, for example, removing the 135 and helicopter questions from an ATP 121 Airplane test and some vague notion that they have the mystical FAA set of magic questions. Virtually everybody we have spoken to who did written test prep at such organizations had the misconception that such services were helping them in such ways. Basically, those people got taken for a ride. That said, our software does* (note: we are depreciating this feature and it may no longer be available in all or any versions due to a small number of people who failed to take the time to read about its clearly stated limitations) feature "crucial" question pools that you can study from. However, if you use these "crucial" pools, you must do so only with full awareness of their strengths and SIGNIFICANT limitations. Our "crucial" question pools are reduced set of questions that have been chosen by our editors as the MOST REPRESENTATIVE of the question pools in general, such that if you are really limited for time and can only study a small subset of questions, do that. This does not mean that the questions in the "crucial" pools will necessarily be the exact ones on your test. Quite often, you will see relatively very few of them. However, the "crucial" questions are chosen such that they cover a vast majority of commonly seen content. However, the fact is that you will need to really and truly know such questions deeply to get benefit from them, and, really you can not expect to perform at your maximum if you study only the "crucial set." In fact, you might even fail. It is always better to study the complete bank of questions. So, why do we include such a "crucial" set. Do AllATPs or other organizations do anything different? maybe somebody really really has little time to study, in which case studying the crucial set is about as good as he can do, though it is certainly no guarantee of success. The problem with the crucial set is that the people who have little time in the first place often do a sloppy job of studying the crucial set. Again, we repeat: study the whole bank if you can. Please note that we are doing EXACTLY what other organizations our doing in this regard except, perhaps, that our crucial sets are done by our editors who breathe this stuff day in and day out. At the end of the day, by using our software, you will save money and time. Just to reiterate: it would be unfair of us to claim as some do that we have access to the "current" set of questions being used from the current FAA question banks. We have the current FAA question banks, and then our instructors make intelligent analysis of them. Don't be fooled by the innuendo and nonsense coming from other test places. There's no way around studying for your ATP or any other FAA test. Yes, once you know how to solve, say, a given weight and balance problem, similar questions will be easy for you - but this means you must really take the time to completely understand the given problem. But certainly for that money you get some great training method, right? Basically, what AllATPs does is sit you in front of a computer where you intensively go through the question bank. There's no magic - it's a bit mind numbing, but good enough. Basically, you sit there for hours and do your best dippy bird impression. The water is the ATP Part 121 (or whichever) question bank. So you sit there for the bulk of the day pressing the space bar or whatever until the questions get lodged in your head. Then you go take the written test where you do a brain dump of what you just memorized. Please remember that there is NO SIGNOFF necessary for your first take of an ATP written test. You only need a signoff if you failed the test once. But maybe you don't want to be a dippy bird. Maybe you actually want to learn the material. Maybe you don't want to spend a whole day sitting blankly at a screen. Our software can also help you there, too. You can configure our software to suit your needs - you can use it to study 'dippy bird' style AND/OR you can use it to thoughtfully learn the material - it's your choice! You can use our software on your schedule to study for the written... be it a few minutes or hours every night, on a "break" at work, or all in one go. Additionally, our software features actual EXPLANATIONS to the questions - so you can learn the WHYs of the material.. pretty useful for that checkride oral that you are pretty likely to face soon enough. Additionally, it stands to note that while many people pass their writtens using the dippy bird method, you'll probably pass with a higher score if you spend a good deal of time studying and take several practice tests over a period of a few days. Our software lets you do this. It's always nice to show a high score on the written to an examiner or interviewer. Additionally, because we offer free lifetime upgrades, you can always go back and review the material using our software, should you want to for whatever reason in the future. But don't take our word for it.. you can download our software yourself.. right now and try it out. What you download is a demo version which has only about 1/20th of the total number of questions enabled. If you like it, pay for it, and you'll get an unlock code emailed to you that will give you full access to ALL the questions in moments. Our aim in this piece is not to denigrate AllATPs. Again, we think they are a great organization and encourage you to consider training with them for your advanced ratings and career prep programs. However, we do think that you can do far better with our written test prep than their quite expensive program.